With cases of the highly contagious disease confirmed in Clark County, residents are urged to get vaccinated. A measles outbreak in a nearby county has the Washington County Department of Health and Human Services urgently reminding parents and guardians this week to ensure their children are vaccinated. The latest report from Clark County, Wash., public health officials on Monday, Jan. 28, stated there are now 35 confirmed cases of measles in the county — which includes Portland suburbs and bedroom communities on the north side of the Columbia River, such as Vancouver, Camas and Battle Ground — after an outbreak of the disease was first reported earlier this month. Officials in Multnomah County confirmed another related case of measles in Oregon over the weekend. 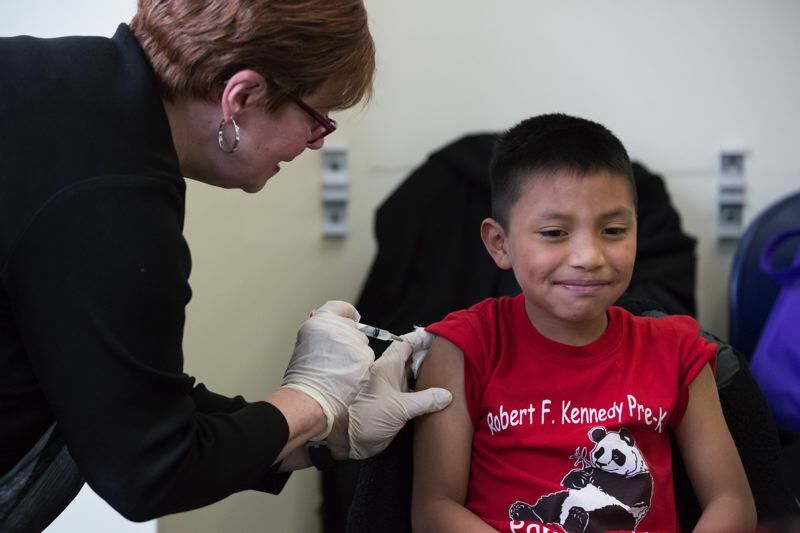 State law in both Oregon and Washington requires that children receive a battery of vaccines in order to attend school or daycare — including MMR, the measles, mumps and rubella vaccine. "The current measles outbreak in Clark County is a compelling example of why getting your children vaccinated is so important," said Dr. Christina Baumann, Washington County's deputy health officer, in a statement released Thursday, Jan. 24. "Measles is preventable because we have a safe and effective vaccine available. Protect yourself, your children and your community." The United States declared measles had been eliminated in the country in 2000. The World Health Organization announced the disease had been eradicated in the Americas altogether in 2016. However, largely due to a dip in the vaccination rate, the highly contagious disease has continued to flare up sporadically. Measles typically causes high fevers and a full-body rash. In extreme cases, it can be fatal, with the WHO estimating about 110,000 measles deaths worldwide in 2017. Although measles is often regarded as a childhood disease, disproportionately affecting children under the age of 5, adults can contract the disease as well, and in some cases, they can also suffer severe effects. Exclusion Day is the date by which parents or guardians must present proof their child has received the required vaccinations in order to continue coming to school or daycare. This year, that date falls on Feb. 20. • National University of Natural Medicine Health Center: 9 a.m. to 1 p.m. Saturday, Feb. 9, for people up to age 18. By appointment only. 11975 S.W. Second Street, Suite 110, Beaverton. Call 503-552-1552 for more information or to schedule an appointment. • Beaverton High School SBHC: 8:30 a.m. to 4 p.m. Monday, Feb. 11, for people ages 4 to 20 who attend school in the Beaverton School District or live within district boundaries. 13002 S.W. Second St., Beaverton. Call 503-356-3985 for more information. • Century High School SBHC: 8:30 a.m. to 4 p.m. Tuesday, Feb. 12, for people up to age 21 who attend school in the Hillsboro School District or live within district boundaries. 1998 S.E. Century Blvd., Hillsboro. Call 503-597-4580 for more information. • Tigard High School SBHC: 8:30 a.m. to 4 p.m. Wednesday, Feb. 13, for people up to age 21 who attend school in the Tigard-Tualatin or Sherwood school districts or live within the boundaries of either district. 9000 S.W. Durham Road, Building 7110, Tigard. Call 503-431-5775 for more information. • Tualatin High School SBHC: 8:30 a.m. to 4 p.m. Thursday, Feb. 14, for people up to age 21 who attend school in the Tigard-Tualatin or Sherwood school districts or live within the boundaries of either district. 22300 S.W. Boones Ferry Road, Tualatin. Call 503-431-5975 for more information. • Forest Grove High School SBHC: 8:30 a.m. to 4 p.m. Friday, Feb. 15, for people up to age 21 who attend school in the Forest Grove, Banks or Gaston school districts or live within the boundaries of any of those districts. 1715 Nichols Lane, Forest Grove. Call 503-359-4057 for more information. At school-based health centers, children ages 14 and under must have a parent or guardian present. Billing is on a sliding scale. Virginia Garcia Memorial Health Center, which operates the school-based clinics, says that no one will be turned away due to inability to pay. It is recommended that patients call ahead to make appointments for vaccinations, as wait times for walk-in patients may be lengthy. • Neighborhood Health Center Tanasbourne Medical & Dental Clinic: 7 a.m. to 6 p.m. Mondays through Fridays. 10690 N.W. Cornell Road, Suite 220, in Hillsboro. Call 503-848-5861 for more information or to schedule an appointment. • Merlo Station High School SBHC: 7 a.m. to 3:30 p.m. Mondays through Fridays. 1841 S.W. Merlo Drive, Beaverton. Call 503-941-3210 for more information or to schedule an appointment. For additional information on getting immunized or accessing other healthcare services, the Washington County Health Care Resource Line can be reached at 503-846-8851. As of last year, Oregon was reported to have the highest rate of "non-medical" vaccine exemptions in the United States. Parents and guardians can request an exemption due to "personal, religious, or philosophical reasons" in Oregon, according to the Oregon Health Authority's website. In 2015, Beaverton Sen. Elizabeth Steiner Hayward, a Democrat, introduced legislation to effectively end non-medical exemptions in the state. Facing opposition from a number of Democrats as well as Republicans, Steiner Hayward later withdrew the proposal. Editor's note: This story has been updated with the most recent number of confirmed measles cases in Clark County, Wash., as of Monday, Jan. 28, as well as the confirmation of measles in Multnomah County.